In My Mailbox is a weekly meme hosted by Kristi at The Story Siren. Each week bloggers post about the books they received in the mail (or books they purchased, checked out from the library, etc.) in order to spread awareness about upcoming books! 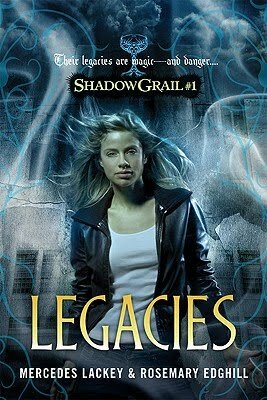 Legacies: A Shadow Grail Novel by Mercedes Lackey and Rosemary Edhill. Tor, July 2010. What Happened on Fox Street by Tricia Springstubb. Balzer + Bray, August 2010. Mo lives on Fox Street with her dad and little sister, the Wild Child. Their house in in the middle of the block - right where a heart would be, if the street were a person. Fox Street has everything: a piano player, a fix-it man, the city's best burrito makers, a woman who cuts Mo's hair just right, not to mention a certain boy who wants to teach her how to skateboard. There's even a mean, spooky old lady, if ringing doorbells and running away, or leaving dead mice in mailboxes, is your idea of fun. Summers are her favorite time because Mo's best friend, Mercedes, comes to stay. Most importantly, though, Fox Street is where all Mo's memories of her mother live. The idea of ever leaving Fox Street is unimaginable - until it isn't. This is the story of one unforgettable summer - a summer of alarming letters, mysterious errands, and surprising revelations - and how a tuft of bright red fur gives Mo the courage she needs.